Meatloaf has been popular on American dinner tables since the Great Depression. Using cheaper cuts of meat, ground with a hand grinder and mixing in grains or breadcrumbs as a binder stretched the family food budget. As I was flipping through the 1964 edition of My Favorite Maryland Recipes by Avalynne Tawes – aka “The Governor’s Lady” because she was the wife of J. Millard Tawes, Maryland’s 54th Governor – I came across a meatloaf recipe called Meat Loaf with a New Taste. 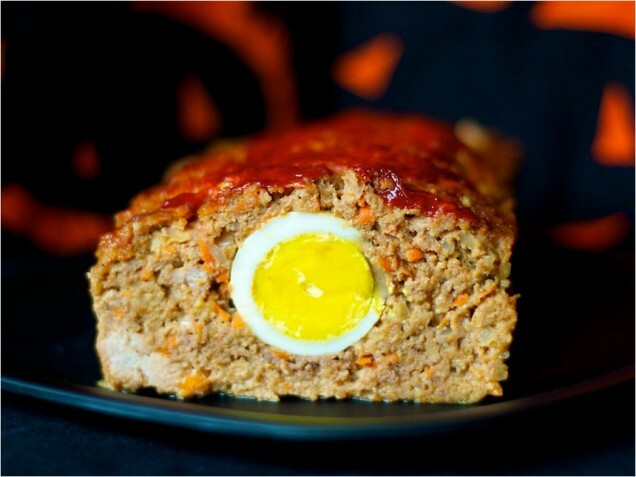 The ingredient that sets this recipe apart from most is the insertion of 4 hard boiled eggs inside the meatloaf. Personally, I’m not a fan of meatloaf, but this recipe makes meatloaf tolerable for me. My husband, who loves meatloaf finds this recipe the most delicious of all meatloaf recipes. The eggs just make it pop! In looking up the history of putting hard-cooked eggs in meatloaf, it appears that it’s a Germanic tradition that spread through much of Eastern Europe, but is also found in Jewish recipes and even recipes originating in the Philippines. In America, inserting hard-cooked eggs has been very popular in the mid-northern states such as Minnesota, Michigan and Wisconsin – areas with strong German immigration. Some recipes say that the inserted eggs help the meatloaf to cook more evenly. The eggs do give this sometimes tired old dish a new twist. Here’s Avalynne’s recipe. Beat the egg lightly; mix with milk, onion, salt, pepper, Worcestershire, mustard and bread crumbs; allow to stand about 5 minutes. Mix in beef. Pack half of meat mixture into loaf-size buttered baking dish (about 8x4x3). Arrange the 4 whole hard-cooked eggs lengthwise over meat in zigzag fashion; pack in remaining meat mixture. Bake in moderate oven 50 to 50 minutes. Allow to stand for about 5 minutes. Turn out and slice. For this and other great Maryland recipes, snag a copy of My Favorite Maryland Recipes by Avalynne Tawes. Though the book is currently out of print, it is readily available from used book dealers. My wonderful home ec teacher at Seton, Sister Augustine, taught us that you put the hard boiled egg in the middle to eliminate the dense center. Therefore you wouldn’t have to cook your meatloaf long enough for it to be done all the way through and your loaf wouldn’t dry out. That makes total sense, Marsha. Those old nuns sure had some good sense. Here’s to Catholic education!